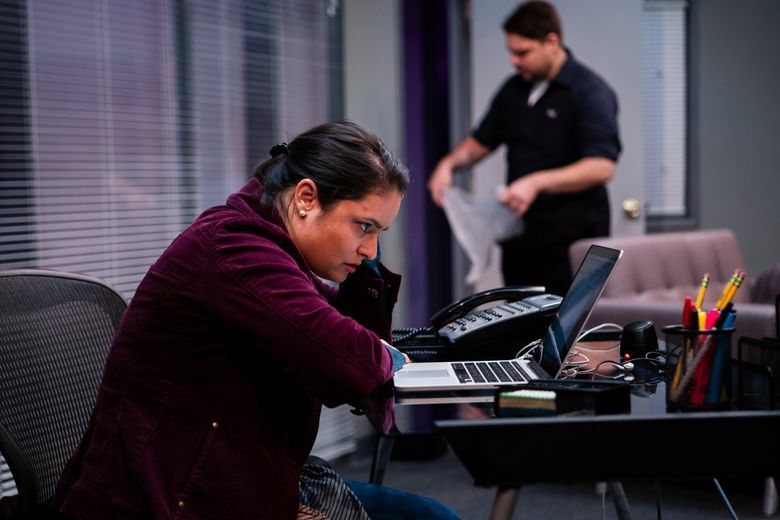 Tanya Saracho's 2017 play, now at Seattle Public Theater, is a two-character excavation of what it means for Lucia, a Mexican-born TV writer, to be "down" — in the eyes of token-minority-hiring TV bosses, and in the eyes of the janitor who takes out the garbage. Second, she’s haunted by the common, writerly suspicion that she’s a fraud. The particulars of her case: Lucia is a young, well-educated novelist from Mexico; grew up with a maid in the house, but is told by at least one co-worker she’s the token “minority hire”; frets about writing a second novel; stumbles over whether to describe the unnamed show’s heroine as “Hispanic” or “Latina” or the gender-neutral “Latinx”; wants to please her bosses but write “real” stories about said heroine; can’t make friends in Los Angeles; etc. 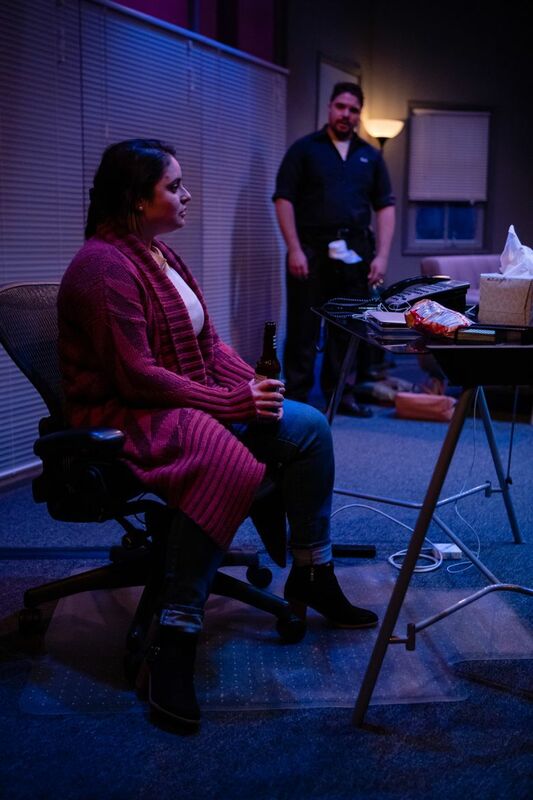 Tanya Saracho‘s 2017 play, now at Seattle Public Theater, is a two-character excavation of what it means to be “down” — in the eyes of token-minority-hiring TV bosses, and in the eyes of the janitor who takes out the garbage. Who is Lucia when nobody’s watching? Lucia and Abel’s sparring (casual, combative, flirtatious) happens entirely in her office, designed by Jenny Littlefield as an uncomfortable place trying really hard to feel comfortable: Lucia’s family photos on the shelves, dark-olive-green wall paint, an ergonomic-looking mesh-backed office chair, punishingly unflattering fluorescent lights. Lucia desperately wants to feel relaxed in the office, like she’s earned the right to be there; Abel accepts that it’s just another place to pull a check. And so it begins: Lucia caught in a trap of dual desire (is she high-class and worthy? Is she a tough, gritty Latinx? Are the two mutually exclusive? ), compounded by the presence of Abel, who regards Lucia’s existential nausea as more luxury than curse. The production’s real pleasure comes from watching the two actors (directed by Pilar O’Connell) dance around Saracho’s seemingly casual, but politically charged, negotiations. Marco Adiak Voli plays Abel with a bearish, marshmallow charm. He’s the gentle kind of tough guy, totally devoid of menace. One gets the sense he could win in a brawl — not by punching back, but by simply absorbing whatever shocks the world threw at him with a quick grimace and a shrug. As Lucia, Ana María Campoy gives us a different animal altogether: at her most vulnerable, Lucia seems like a flailing, hypercerebral fish who’s just been caught, frustrated that she can’t think her way back into the water. But deep down, we can sense the stirring instincts of a shark. But he and Campoy both admitted their allegiances shift between the two characters, depending on the day. In the end, there’s no right answer. “Fade” by Tanya Saracho. Through Nov. 4; Seattle Public Theater, 7312 W. Green Lake Dr. N., Seattle; $17-$34; 206-524-1300; seattlepublictheater.org. Brendan Kiley: bkiley@seattletimes.com. Brendan Kiley is an arts and culture reporter at The Seattle Times.